Merry Christmas! and Happy Hanukkah! Morning gifts from Santa, parents, friends, and (strangely) my cats. Didn't know cats wanted to buy me socks. I am encouraged by them coming out of hiding and interacting with people; it's only taken them 5 days to get this comfortable. Of course, in 2 days I'm traumatizing them again with another 4 hour drive. We then loved spending the afternoon with extended family. I'm kind of proud of myself - with all the amazing food, snacks, and desserts, I'm still almost 400 calories under my limit for the day. Restraint...who knew? 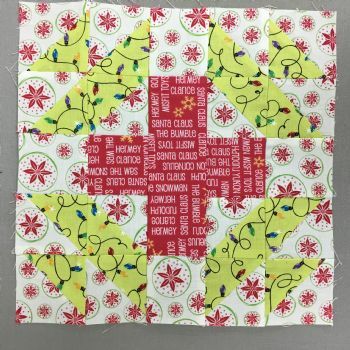 Today's block - Christmas Star II - had to wait until we got back, but it got made. I did sew one square on upside down and had to recut it. Could have unpicked and resewn, but that just seemed like too much work. Not sure about the colors, but I like the block itself. Only 6 blocks left. I taught my niece how to close a pillow cover yesterday with the ladder stitch. She did a beautiful job. I'm so glad the next generation is still interested in the needle arts.